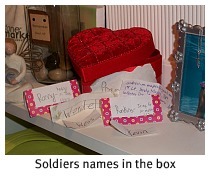 God Places Another Soldier in the Prayer Box | Mother of the WHAT?! Three flights, that’s what it took to get from my home in Indiana to Bismarck, North Dakota for an American Mothers engagement. As I sat in Minneapolis waiting for my next flight, I noticed a soldier standing near talking to another passenger. Oh, there he is. I thought to myself. I had forgotten about the soldier that I was likely to meet, but when I saw him I was not surprised. (If you don’t know what I am talking about check out the links below.) I was sure when we boarded that he would be seated next or near to me, but he wasn’t, and to be perfectly honest, I forgot about him. As I waited and waited for my luggage in Bismarck, it became clear that it wasn’t going to arrive on the carousel. I wasn’t the only one, there were two of us without luggage; me and the soldier. Of course. So I chuckled inside and walked over to him. “We don’t know each other, but I have a thirteen year old daughter who has a heart to pray for soldiers. Each time I travel, there is a soldier on my plane, it’s my job to get his name so she can add him to her prayer box and pray for him.” I discovered his name is G. Cave and that he is leaving in August for one year in Afghanistan. He has a wife and six children and he said he would greatly appreciate prayers. Mission accomplished. I wondered out loud if my bag had arrived earlier because of a missed flight I had due to a delay. He said that wouldn’t be his case but walked with me anyway as I went to the counter to ask. Both of our bags were brought to us right away and off we went on our separate ways. Believe what you want, but I believe his name is supposed to be in the prayer box, and God did what He did to make sure that happened. I am amazed as God continues to put soldiers in my path, and that He has placed this ministry of prayer upon the heart of my child. Be safe G. Cave, you and your family are being prayed for in our home.